I'm a big fan of dry yeasts. Many brewers believe that liquid yeast is the only way to go and that dry yeast is inferior. That may have been the case in the past but dry yeast processing has come a long way in recent years. I use lots of US-05 in my homebrews, especially when I am in recipe development mode. 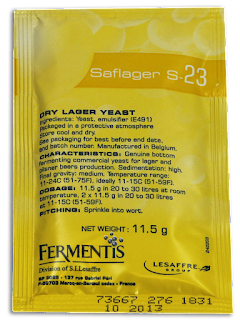 For Big Brew Day 2017 I brewed up a "Polish Ale" kit from AIH but it was actually a lager because I used Saflager S-23 from Fermentis. 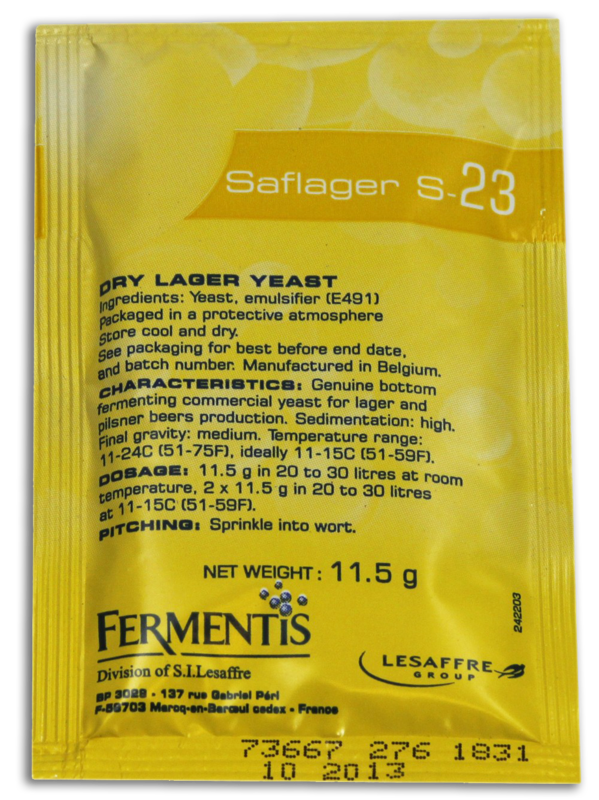 S-23 is a dry lager yeast. It is recommended for the production of fruity and estery lagers at 51F-59F. I have had beers fermented at typical larger temperature range with this yeast and it produces quite a bit of fruity esters. When fermented at ale temperatures something magical happens. It ferments out to an unbelievably clean lager. That was the last beer that I brewed before I got my fermentation fridge so I was very tempted to pitch US-05 but some fellow club members told me about their experiences with S-23. One guy, in particular, has used it a lot. He said that for clean results treat S-23 just like an ale yeast. My experiences confirmed his advice. Pitch re-hydrated S-23 into well-aerated wort at 52F. Bring the beer up to 68F for 4 days. Bring the beer up to 70F for 3 more days. We are now at the two-week mark for fermentation. Drop the temperature to 64F for 1 days. Drop the temperature to 58F for 1 days. Drop the temperature to 48F for 1 days. Drop the temperature to 44F for 1 days. Drop the temperature to 40F for 1 days. Drop the temperature to 37F until bottling day. This profile fits my system and your values may vary from mine. The crash phase is extended but is planned around my beer rotation. Crashing can be done in as little as 2 days but more time should yield better clarity. After bottling I let these beers sit at room temperature for carbing and conditioning for two weeks and them "lager condition" in the bottle for another week by placing them in the refrigerator. After that, the beer is ready to drink. Please note that I have only been using this yeast for beer in the 4.5% to 6.5% range so a higher gravity beer will need more conditioning time and possibly more primary fermentation time. I have noticed a long lag time using this yeast of up to 3 days but once it starts it moves fast. A diacetyl rest is advised since this is a lager strain but I cannot say that it is necessary because I have always taken the time for that step when using S-23. Safale says that the attenuation numbers on this strain are a little low but I have gotten up to 88% attenuation using a big healthy pitch that was harvested from the fermenter and rinsed. Get a pack or two of S-23 and give this yeast a shot. You will be surprised at how easy you can craft a nice lager without all of the typical lager troubles and legwork. Treat your beer like an ale, add a diacetyl rest and voila, you have a homebrewed lager. Get some S-23 from AIH by clicking HERE. Get some S-23 from MoreBeer by clicking HERE. Note: I am bottle conditioning an international pale lager that included S-23 now. I am currently fermenting an IPL (India pale lager) with S-23 and those recipes will be linked here when the beers are ready.